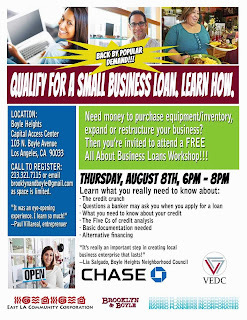 Valley Economic Development Center, in conjunction with East LA Community Corp. (ELACC), Barrio Planners with support from Brooklyn & Boyle, are pleased to present the fourth and final in a series of FREE and extremely informative workshops on improving your access to capital and the tools you need for growing your small, neighborhood-based business or launching a one!!! 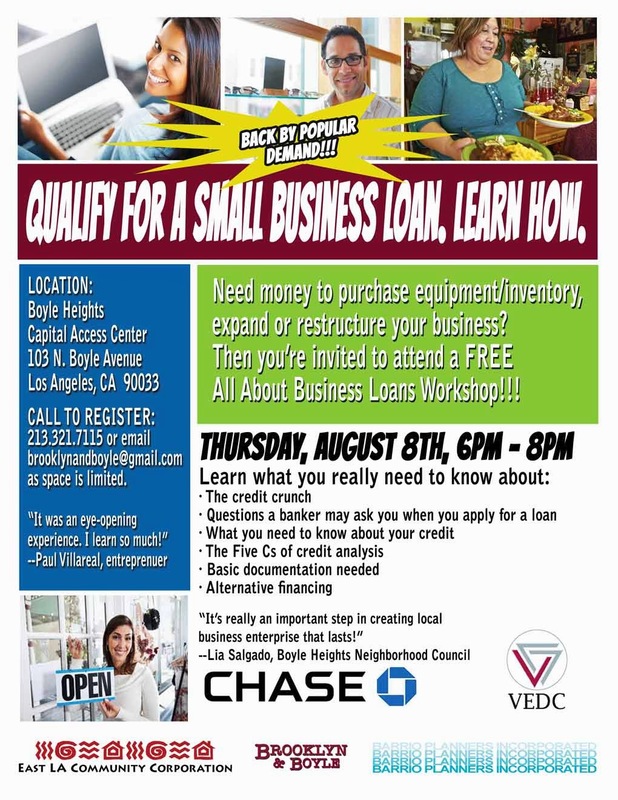 There is absolutely no obligation to apply for a loan, even though VEDC does, indeed, have a fund specifically allocated for loans to small business owners in Boyle Heights and surrounding communities. The workshop is simply a very good place to start because the information presented helps eliminate all the red tape and mumbo jumbo you would normally get from a bank when you walk in to ask for help. In clear, understandable bi-lingual format (Spanish speakers also strongly encouraged to attend), the workshop takes all the mystery out of the process. Learn the do's and don'ts, the ins and outs of credit and how to work around a low credit score, alternative financing and more. The workshop is completely free The knowledge and know how you will gain is more than worth the two hour investment of your time. Join us for light refreshments. Only 20 spaces are available to email us at BrooklynandBoyle@gmail.com to reserve your seat. You may also call 213-321-7115 and make a reservation in person. Hope to see you there! best regards y muchas gracias!